Searching for George Chandler on Ancestry I came across a conviction for delinquent behaviour in 1900 when he was 13 years old. The warrant states, “He is habitually wandering about the streets in no ostensible lawful occupation”. The record goes on to say George’s character is “Bad” and that he has previously been before the magistrate and given a reprimand. It seems George was not attending school, engaging in anti-social activities with questionable company at all hours of the day and night. What I didn’t understand was the title of this document; “Entrance Books for the Vernon and the Sobraon, 1867-1911″. 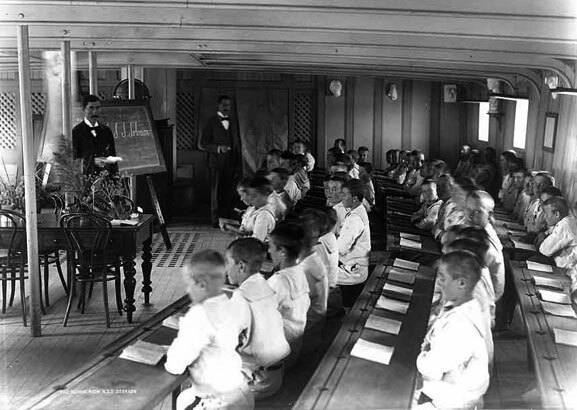 It turns out, before NSW had reform schools, wayward boys were removed from their families, housed on Nautical School Ships and taught elementary educational, nautical and industrial skills in an effort to turn them into worthy citizens. George Chandler was sent to the NSS Sobraon. For 24 years, from 1866-1891, the Aberdeen built clipper ship “Sobraon” brought passengers from England to Australia in comfort and speed. But in 1891 she was bought by the NSW government and permanently moored near Cockatoo Island in Sydney Harbour. For the next twenty years the “Sobraon” would be a floating reformatory for delinquent boys. The “Sobraon” replaced the “Vernon” and with it’s accommodation for more than 200 boys had more than three times the capacity of the “Vernon”. Over its twenty year life as a Nautical School Ship 4000 boys were trained on the “Sobraon”. Sobraon boys remained until they received sufficient skills to be apprenticed, join the navy or return to their families. It seems to have been the particular wording used by police to encourage a magistrate to remove a troublesome boy from the streets. As a matter of fact, when George’s younger brother, Reginald, was also sent to the “Sobraon” his description was exactly the same. The educational program provided aboard the “Sobraon” achieved impressive outcomes, particularly considering the poor level of literacy many of the boys brought with them. There is little doubt they had opportunities on the “Sobraon” that they couldn’t get in their home environment even considering class sizes of 60 or 70 students was the norm. 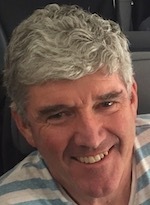 George left the “Sobraon” to be apprenticed as a farm labourer to Michael Hanrahan at Robertson in the NSW southern Highlands. In 1904, at 17 years old, he was returned to the “Sabraon” for absconding from his employer. In 1912 George married Flora Westlake (a young widow with a 9 year old son). I can find no evidence George and Flora had children of their own. George and Flora lived in Erskinville and George worked as a wharf labourer. Police warrants were issued for George’s arrest in 1921 for violent conduct and malicious damage in their home, and on two occasions in 1922 for wife desertion. In 1943 George was living without Flora in Glebe. George Chandler died on 9 May 1953 at the age of 66. I can’t know whether being a Sobraon boy made his life better or worse but I thank him for introducing me to a chapter of NSW education history that I had not previously known. musician, coffee roaster and home baker.